Development of the RT-2, the Soviet Union's first solid propellant ICBM, was undertaken by Sergei Korolev and his successor from 1961-1968. It was a huge technical challenge, involving technology in which the Russians had no prior experience. The high-priority RT-2 preoccupied Korolev and his team throughout the period of the moon race, and could be considered a factor in the loss of that race to the Americans. In the end only sixty were deployed, but these provided the technical basis for Russian ballistic missiles of the 1980's and beyond. AKA: 15F1;15P098;8K98;RS-12;Savage;SS-13 Mod.1. Status: Retired 1992. First Launch: 1966-01-01. Last Launch: 1970-01-01. Number: 41 . Payload: 600 kg (1,320 lb). 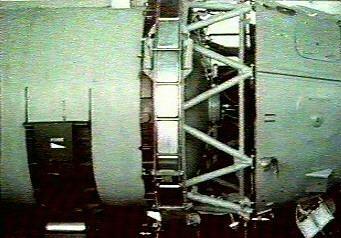 Thrust: 860.00 kN (193,330 lbf). Gross mass: 51,000 kg (112,000 lb). Height: 21.27 m (69.78 ft). Diameter: 1.84 m (6.03 ft). Span: 3.62 m (11.87 ft). Apogee: 1,000 km (600 mi). 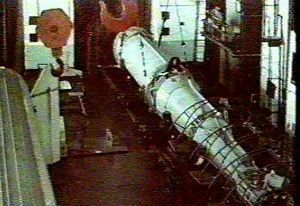 The RT-2 was the Soviet Union's first solid propellant ICBM. It represented Korolev's conviction that the best technical solution for a military missile involved the use of solid propellants, as opposed to the dangerous storable liquid propellants favored by the rest of the Soviet military-industrial complex. Design of this equivalent to the Minuteman was only beginning when the US ICBM was being test-fired. Development proceeded slowly due to technical problems, opposition from other chief designers, and possibly limited availability of certain key materials that could only be surreptitiously purchased in the United States. Unusually for a missile that became operational, the RT-2 was displayed in a Moscow Parade on 9 May 1965, possibly indicating that the leadership considered it a dead project. The peak deployment of 60 missiles was only attained in 1971, at a time when 1,000 Minutemen were in service. Service life was only a few years, possibly indicating problems in solid fuel ageing. 60 remained the total number of solid propellant Soviet ICBM's deployed until the 1980's, when the mobile RT-12M and RT-23 finally began replacing liquid propellant ICBM's. The first stage was developed by NII-130 in Perm under the leadership of M Yu Tsirulnikov, who was also responsible for development of the RT-15 variant. The stage was built at Factory 98 in Perm and the original polyfurite-binder propellant was to be formulated by NII-130 Perm. The second stage was developed by TsKB-7 (Arsenal) in Leningrad under the supervision of P A Tyurin, who was also responsible for the RT-25 variant. The stage was built at the Morozov Factory and the polyurethane-binder propellant was to be by V S Shpak at GIPKh. The third stage was originally to be developed by TsKB-7, with an alternate design by Zhukov and NII-125. The common miniaturized inertial guidance system for all variants was by Pilyugin. A polyurethane-binder propellant, designed by Vladimir Shpak at GIPKh Leningrad (State Institute for Chemical Research). This was available at the start of development and was used for stand tests of the second stage. But it did not have a high enough performance. A polyfurite-binder propellant, designed by Leonid Kozlov at NII-130 in Perm. This was used in stand tests of the first stage but found to be too inelastic for use in such a large stage. It was however adopted for use in the third stage. A terminated polybutadiene-binder propellant, designed by Boris Zhukov at NPO Soyuz in Lyuberetsk and Yakov Savchenko at Altaisk NII in 1963. This was tested in the third stage but was still not considered elastic enough use in the larger first and second stages. A rubberized butyl binder propellant, tested by Savchenko in mid-1965. This finally exhibited the necessary high performance and elastic properties, and was adopted for both the first and second stages of the missile. The silo was designed by TsKB-34 Spetsmash. Originally two variants were considered - single isolated silos with a launch group, and groups of silos controlled from a single hardened command point. The final variant in the development phase consisted of one command point per ten silos. All were equipped with hydraulic shock absorber devices. The water in the system was spilled onto the flame pit, and the steam generated helped to accelerate the missile out of the silo. The command point was provided with supplies for three years of autonomous operation. Pilyugin developed the SDUK command and control system, which allowed RSVN headquarters southwest of Moscow to securely order launch of all missiles within three minutes of the 'go' order. The TTT specification and development schedule was completed on 29 January 1962. This envisioned use of the missile with two alternate light nuclear warheads, the larger one with a yield of 1.65 MT. Two different types of silo launcher were proposed, and one train-launched version. The draft project was completed in March 1963. Flights of the third stage on the RT-1-63 test vehicle were conducted between September and November 1965 from Kapustin Yar. Seven initial trials of the RT-2 itself on short-range shots were conducted from LC-87 at Kapustin Yar from 5 February to July 1966, using a silo originally designed for the R-14. The first launch attempt was unsuccessful, the missile guidance failing in the silo two seconds before launch, and the missile roared off unguided. The second attempt on 25 February was also unsuccessful, but a successful test was achieved the next day. The tests then moved to Plesetsk for longer-range flights. 25 test flights were made between 4 November 1966 and 3 October 1968, of which 16 were successful. The missile was accepted by the military on 18 December 1968. Production of the missile was entrusted to PZKhO Factory 98 in Perm, operated by Arsenal Leningrad. A missile regiment consisted of one hardened 15B52 command point per ten 15P798 silos, all designed by V V Chernetskiy at TsKB-34. Each silo was separated from the other by 10-12 km and were designed to have a 20 year life. Construction of silos began in 1967, and the first unit became operational at Yoshkar-Ola on 28 August 1968. By 1971 the total deployment there had reached the final total of six regiments / 60 silos. Even though service tests from Plesetsk indicated an allowable storage life of 15 to 17 years, the first-generation RT-2 was replaced from 1972 by the RT-2P. The final RT-2 was retired in 1976. The RT-2 was flown on a total of 44 development flights and 19 operational test flights to 1974, including 5 shots from operational silos at Yoshkar-Ola. The train-based version was designed, but like the rail-launched Minuteman, never tested or deployed. The missile train would have consisted of four cars with RT-2 missiles, one power generation car, two cars with equipment for test and preparation of the missiles, one command car, one sleeping car, and one car with common crew rest and eating facilities. Guidance contractor: Pilyugin. Maximum range: 9,600 km (5,900 mi). Number Standard Warheads: 1. Standard RV: 15F1. Warhead yield: 600 KT. CEP: 2.00 km (1.20 mi). Alternate warhead: 1,400 kg (3,000 lb). Maximum range with alternate warhead: 4,000 km (2,400 mi). Number Alternate Warheads: 1. Alternate warhead yield: 1,650 KT. Boost Propulsion: Solid. Cruise Thrust: 323.000 kN (72,613 lbf). Cruise Thrust: 33,000 kgf. Cruise engine: 15D24. Stage 3 Thrust: 137.000 kN (30,798 lbf). Stage 3 Thrust: 14,000 kgf. Initial Operational Capability: 1969. Total Number Built: 123. Total Development Built: 44. Total Production Built: 79. RT-15 Russian intermediate range ballistic missile. The RT-15 IRBM used the second and third stages if the RT-2 ICBM. After protracted development in 1961-1970 with a range of alternative self-propelled mobile launchers, limited numbers ('few' to 19) of two types of launchers were deployed in 1970. The various transporters tested created confusion in the West (with designations SS-14 Scapegoat and Scamp being applied). RT-2P Russian intercontinental ballistic missile. Development of the improved RT-2P version of the basic missile was authorized by decree 1004-365 of 18 December 1968. The overriding concern was imminent deployment by the Americans of the Safeguard anti-ballistic missile system, and the need for the missile to have the necessary countermeasures to defeat those defenses. RT-2M Russian intercontinental ballistic missile. The RT-2M was a modernized RT-2, developed under Savodskiy at Korolev's bureau beginning in the late 1960's in parallel with the RT-2P and using alternate new engines. This increased both range and payload compared to the RT-20. However the RT-2P was selected for further development. Family: ICBM, silo-launched. Country: Russia. Launch Sites: Kapustin Yar, Plesetsk, Kapustin Yar PL87, Plesetsk LC161. Stages: 15D23, 15D24, 15D25. Agency: Korolev bureau. Bibliography: 2, 21, 475, 476, 8554. 1959 February 20 - . LV Family: RT-2. Launch Vehicle: RT-1. RT-1 experimental solid propellant ballistic missile development authorised - . Nation: Russia. Related Persons: Korolev. Korolev was to begin development of the three stage rocket, which was to have a range of 800 to 2500 km and a lift-off mass of 35 tonnes..
1959 July 3 - . LV Family: RT-2. Launch Vehicle: RT-1. Development of solid propellant ICBM begun. - . Nation: Russia. State Committee for Defence Technology (GKOT) Decree 'On attaching of TsNII-58 for solid-propellant work to OKB-1' was issued..
1961 April 4 - . LV Family: RT-2. Launch Vehicle: RT-1. Development of the RT-2 ICBM authorised by a decree in parallel with the RT-1. - . Nation: Russia. Development of the RT-2 ICBM was authorised by a decree of 4 April 1961 in parallel with the RT-1..
1962 March 1 - . Launch Site: Kapustin Yar. Launch Complex: Kapustin Yar V-2. LV Family: RT-2. Launch Vehicle: RT-1. FAILURE: Failure. Nation: Russia. Agency: RVSN. Apogee: 10 km (6 mi). 1962 April 28 - . Launch Site: Kapustin Yar. Launch Complex: Kapustin Yar V-2. LV Family: RT-2. Launch Vehicle: RT-1. Test mission - . Nation: Russia. Agency: RVSN. Apogee: 500 km (310 mi). 1963 March - . Launch Vehicle: RT-2. RT-2 draft project completed - . Nation: Russia. Related Persons: Korolev. Korolev completed the draft project in March 1963. The modular design had three stages, each with three nozzles..
1963 March 18 - . Launch Site: Kapustin Yar. Launch Complex: Kapustin Yar V-2. LV Family: RT-2. Launch Vehicle: RT-1. 1963 June 1 - . Launch Site: Kapustin Yar. Launch Complex: Kapustin Yar V-2. LV Family: RT-2. Launch Vehicle: RT-1. 1964? - . Launch Site: Kapustin Yar. Launch Complex: Kapustin Yar V-2. LV Family: RT-2. Launch Vehicle: RT-1. 1965 - . Launch Site: Kapustin Yar. Launch Complex: Kapustin Yar V-2. LV Family: RT-2. Launch Vehicle: RT-1. 1965 - . Launch Site: Kapustin Yar. Launch Complex: Kapustin Yar V-2. LV Family: RT-2. Launch Vehicle: RT-15. 1965 September 1 - . Launch Site: Kapustin Yar. Launch Complex: Kapustin Yar LC84. Launch Pad: LC84?. LV Family: RT-2. Launch Vehicle: RT-15. 1965 September 1 - . Launch Site: Kapustin Yar. Launch Complex: Kapustin Yar V-2. LV Family: RT-2. Launch Vehicle: RT-1. FAILURE: Failure. Test mission - . Nation: Russia. Agency: RVSN. Apogee: 10 km (6 mi). 1965 October 1 - . Launch Site: Kapustin Yar. Launch Complex: Kapustin Yar V-2. LV Family: RT-2. Launch Vehicle: RT-1. 1965 November 1 - . Launch Site: Kapustin Yar. Launch Complex: Kapustin Yar V-2. LV Family: RT-2. Launch Vehicle: RT-1. FAILURE: Failure. 1965 December - . LV Family: RT-2. Launch Vehicle: RT-1. Work ended on the experimental RT-1 missile. - . Nation: Russia. The tests on this missile proved concepts and hardware for the RT-2 operational solid propellant ICBM. 1966 - . Launch Site: Kapustin Yar. Launch Complex: Kapustin Yar PL87. Launch Vehicle: RT-2. 1966 February 5 - . Launch Site: Kapustin Yar. Launch Complex: Kapustin Yar PL87. Launch Vehicle: RT-2. FAILURE: Failure. 1966 February 25 - . Launch Site: Kapustin Yar. Launch Complex: Kapustin Yar PL87. Launch Vehicle: RT-2. FAILURE: Failure. 1966 February 26 - . Launch Site: Kapustin Yar. Launch Complex: Kapustin Yar PL87. Launch Vehicle: RT-2. 1966 July 1 - . Launch Site: Kapustin Yar. Launch Complex: Kapustin Yar PL87. Launch Vehicle: RT-2. November 1966 - . Launch Site: Kapustin Yar. LV Family: RT-2. Launch Vehicle: RT-15. First RT-15 launch in regiment test series. - . Nation: Russia. Agency: RVSN. 1966 November 4 - . 08:00 GMT - . Launch Site: Plesetsk. Launch Complex: Plesetsk LC161. Launch Pad: LC161/1. Launch Vehicle: RT-2. 1966 Dec - . Launch Site: Plesetsk. Launch Vehicle: RT-2. 8K98 DT-3 - . Nation: Russia. Agency: RVSN. Apogee: 100 km (60 mi). 8K98 DT-2 - . Nation: Russia. Agency: RVSN. Apogee: 100 km (60 mi). 1967? - . Launch Site: Plesetsk. Launch Vehicle: RT-2. 1967 - . Launch Site: Plesetsk. Launch Vehicle: RT-2. 8K98 DT-13 - . Nation: Russia. Agency: RVSN. Apogee: 1,000 km (600 mi). 8K98 DT-14 - . Nation: Russia. Agency: RVSN. Apogee: 1,000 km (600 mi). 1967 - . Launch Site: Kapustin Yar. Launch Complex: Kapustin Yar V-2. LV Family: RT-2. Launch Vehicle: RT-15. 8K98 DT-16 - . Nation: Russia. Agency: RVSN. Apogee: 1,000 km (600 mi). 8K98 DT-17 - . Nation: Russia. Agency: RVSN. Apogee: 1,000 km (600 mi). 8K98 DT-15 - . Nation: Russia. Agency: RVSN. Apogee: 1,000 km (600 mi). 1968 - . Launch Site: Plesetsk. Launch Vehicle: RT-2. 1968 - . Launch Site: Kapustin Yar. Launch Complex: Kapustin Yar V-2. LV Family: RT-2. Launch Vehicle: RT-15. 1968? - . Launch Site: Plesetsk. Launch Vehicle: RT-2. 1968 August 28 - . Launch Site: Plesetsk. Launch Vehicle: RT-2. 1968 October 3 - . Launch Site: Plesetsk. Launch Vehicle: RT-2. 1969 - . Launch Site: Kapustin Yar. Launch Complex: Kapustin Yar V-2. LV Family: RT-2. Launch Vehicle: RT-15. 1969 - . Launch Site: Plesetsk. Launch Vehicle: RT-2. RT2 PL69-01 - . Nation: Russia. Agency: RVSN. Apogee: 1,000 km (600 mi). RT2 PL69-02 - . Nation: Russia. Agency: RVSN. Apogee: 1,000 km (600 mi). 1969 April 29 - . Launch Site: Plesetsk. Launch Vehicle: RT-2. 1969 July 25 - . Launch Site: Plesetsk. Launch Vehicle: RT-2. RT2 PL69-04 - . Nation: Russia. Agency: RVSN. Apogee: 1,000 km (600 mi). 1969 August 15 - . Launch Site: Plesetsk. Launch Vehicle: RT-2. RT2 PL69-05 - . Nation: Russia. Agency: RVSN. Apogee: 1,000 km (600 mi). 1969 September 18 - . Launch Site: Plesetsk. Launch Vehicle: RT-2. RT2 PL69-06 - . Nation: Russia. Agency: RVSN. Apogee: 1,000 km (600 mi). 1969 November 10 - . Launch Site: Plesetsk. Launch Vehicle: RT-2. RT2 PL69-07 - . Nation: Russia. Agency: RVSN. Apogee: 1,000 km (600 mi). 1970 - . Launch Site: Plesetsk. LV Family: RT-2. Launch Vehicle: RT-2P. RT2 PL70-03 - . Nation: Russia. Agency: RVSN. Apogee: 1,000 km (600 mi). RT2 PL70-04 - . Nation: Russia. Agency: RVSN. Apogee: 1,000 km (600 mi). RT2 PL70-05 - . Nation: Russia. Agency: RVSN. Apogee: 1,000 km (600 mi). RT2 PL70-12 - . Nation: Russia. Agency: RVSN. Apogee: 1,000 km (600 mi). 1970 - . Launch Site: Kapustin Yar. Launch Complex: Kapustin Yar V-2. LV Family: RT-2. Launch Vehicle: RT-15. 1970 - . Launch Site: Plesetsk. Launch Vehicle: RT-2. RT2 PL70-02 - . Nation: Russia. Agency: RVSN. Apogee: 1,000 km (600 mi). 1970 January 16 - . Launch Site: Plesetsk. Launch Complex: Plesetsk LC161. Launch Pad: LC161/ShPU-2. LV Family: RT-2. Launch Vehicle: RT-2P. 1970 March 1 - . Launch Site: Kapustin Yar. Launch Complex: Kapustin Yar V-2. LV Family: RT-2. Launch Vehicle: RT-15. 1970 March 3 - . Launch Site: Plesetsk. LV Family: RT-2. Launch Vehicle: RT-2P. RT2 PL70-06 - . Nation: Russia. Agency: RVSN. Apogee: 1,000 km (600 mi). 1970 June 29 - . Launch Site: Plesetsk. LV Family: RT-2. Launch Vehicle: RT-2P. RT2 PL70-07 - . Nation: Russia. Agency: RVSN. Apogee: 1,000 km (600 mi). 1970 August 18 - . Launch Site: Plesetsk. LV Family: RT-2. Launch Vehicle: RT-2P. RT2 PL70-08 - . Nation: Russia. Agency: RVSN. Apogee: 1,000 km (600 mi). 1970 September 4 - . Launch Site: Plesetsk. LV Family: RT-2. Launch Vehicle: RT-2P. RT2 PL70-09 - . Nation: Russia. Agency: RVSN. Apogee: 1,000 km (600 mi). 1970 November 1 - . Launch Site: Plesetsk. LV Family: RT-2. Launch Vehicle: RT-2P. 1971 - . Launch Site: Plesetsk. LV Family: RT-2. Launch Vehicle: RT-2P. RT2 PL71-01 - . Nation: Russia. Agency: RVSN. Apogee: 1,000 km (600 mi). 1971 April 27 - . Launch Site: Plesetsk. LV Family: RT-2. Launch Vehicle: RT-2P. 1972 - . Launch Site: Plesetsk. LV Family: RT-2. Launch Vehicle: RT-2P. RT2 PL72-02 - . Nation: Russia. Agency: RVSN. Apogee: 1,000 km (600 mi). RT2 PL72-03 - . Nation: Russia. Agency: RVSN. Apogee: 1,000 km (600 mi). RT2 PL72-04 - . Nation: Russia. Agency: RVSN. Apogee: 1,000 km (600 mi). RT2 PL72-05 - . Nation: Russia. Agency: RVSN. Apogee: 1,000 km (600 mi). RT2 PL72-06 - . Nation: Russia. Agency: RVSN. Apogee: 1,000 km (600 mi). 1972 January 1 - . Launch Site: Plesetsk. LV Family: RT-2. Launch Vehicle: RT-2P. 1973 - . Launch Site: Plesetsk. LV Family: RT-2. Launch Vehicle: RT-2P. RT2 PL73-01 - . Nation: Russia. Agency: RVSN. Apogee: 1,000 km (600 mi). 1974 - . Launch Site: Plesetsk. LV Family: RT-2. Launch Vehicle: RT-2P. RT2 PL74-03 - . Nation: Russia. Agency: RVSN. Apogee: 1,000 km (600 mi). RT2 PL74-01 - . Nation: Russia. Agency: RVSN. Apogee: 1,000 km (600 mi). RT2 PL74-05 - . Nation: Russia. Agency: RVSN. Apogee: 1,000 km (600 mi). RT2 PL74-04 - . Nation: Russia. Agency: RVSN. Apogee: 1,000 km (600 mi). RT2 PL74-02 - . Nation: Russia. Agency: RVSN. Apogee: 1,000 km (600 mi). 1975 - . Launch Site: Plesetsk. LV Family: RT-2. Launch Vehicle: RT-2P. RT2 PL75-01 - . Nation: Russia. Agency: RVSN. Apogee: 1,000 km (600 mi). RT2 PL75-06 - . Nation: Russia. Agency: RVSN. Apogee: 1,000 km (600 mi). RT2 PL75-05 - . Nation: Russia. Agency: RVSN. Apogee: 1,000 km (600 mi). RT2 PL75-04 - . Nation: Russia. Agency: RVSN. Apogee: 1,000 km (600 mi). RT2 PL75-03 - . Nation: Russia. Agency: RVSN. Apogee: 1,000 km (600 mi). RT2 PL75-02 - . Nation: Russia. Agency: RVSN. Apogee: 1,000 km (600 mi). 1975 Dec - . Launch Site: Plesetsk. LV Family: RT-2. Launch Vehicle: RT-2P. RT2 PL75-07 - . Nation: Russia. Agency: RVSN. Apogee: 1,000 km (600 mi). 1976 - . Launch Site: Plesetsk. LV Family: RT-2. Launch Vehicle: RT-2P. RT2 PL76-04 - . Nation: Russia. Agency: RVSN. Apogee: 1,000 km (600 mi). RT2 PL76-08 - . Nation: Russia. Agency: RVSN. Apogee: 1,000 km (600 mi). RT2 PL76-07 - . Nation: Russia. Agency: RVSN. Apogee: 1,000 km (600 mi). RT2 PL76-05 - . Nation: Russia. Agency: RVSN. Apogee: 1,000 km (600 mi). RT2 PL76-03 - . Nation: Russia. Agency: RVSN. Apogee: 1,000 km (600 mi). RT2 PL76-02 - . Nation: Russia. Agency: RVSN. Apogee: 1,000 km (600 mi). RT2 PL76-06 - . Nation: Russia. Agency: RVSN. Apogee: 1,000 km (600 mi). RT2 PL76-01 - . Nation: Russia. Agency: RVSN. Apogee: 1,000 km (600 mi). 1977 - . Launch Site: Plesetsk. LV Family: RT-2. Launch Vehicle: RT-2P. RT2 PL77-10 - . Nation: Russia. Agency: RVSN. Apogee: 1,000 km (600 mi). RT2 PL77-01 - . Nation: Russia. Agency: RVSN. Apogee: 1,000 km (600 mi). RT2 PL77-02 - . Nation: Russia. Agency: RVSN. Apogee: 1,000 km (600 mi). RT2 PL77-03 - . Nation: Russia. Agency: RVSN. Apogee: 1,000 km (600 mi). RT2 PL77-04 - . Nation: Russia. Agency: RVSN. Apogee: 1,000 km (600 mi). RT2 PL77-05 - . Nation: Russia. Agency: RVSN. Apogee: 1,000 km (600 mi). RT2 PL77-06 - . Nation: Russia. Agency: RVSN. Apogee: 1,000 km (600 mi). RT2 PL77-07 - . Nation: Russia. Agency: RVSN. Apogee: 1,000 km (600 mi). RT2 PL77-08 - . Nation: Russia. Agency: RVSN. Apogee: 1,000 km (600 mi). RT2 PL77-09 - . Nation: Russia. Agency: RVSN. Apogee: 1,000 km (600 mi). 1978 - . Launch Site: Plesetsk. LV Family: RT-2. Launch Vehicle: RT-2P. RT2 PL78-02 - . Nation: Russia. Agency: RVSN. Apogee: 1,000 km (600 mi). RT2 PL78-04 - . Nation: Russia. Agency: RVSN. Apogee: 1,000 km (600 mi). RT2 PL78-06 - . Nation: Russia. Agency: RVSN. Apogee: 1,000 km (600 mi). RT2 PL78-05 - . Nation: Russia. Agency: RVSN. Apogee: 1,000 km (600 mi). RT2 PL78-01 - . Nation: Russia. Agency: RVSN. Apogee: 1,000 km (600 mi). RT2 PL78-03 - . Nation: Russia. Agency: RVSN. Apogee: 1,000 km (600 mi). 1979 - . Launch Site: Plesetsk. LV Family: RT-2. Launch Vehicle: RT-2P. RT2 PL79-01 - . Nation: Russia. Agency: RVSN. Apogee: 1,000 km (600 mi). RT2 PL79-03 - . Nation: Russia. Agency: RVSN. Apogee: 1,000 km (600 mi). RT2 PL79-07 - . Nation: Russia. Agency: RVSN. Apogee: 1,000 km (600 mi). RT2 PL79-04 - . Nation: Russia. Agency: RVSN. Apogee: 1,000 km (600 mi). RT2 PL79-05 - . Nation: Russia. Agency: RVSN. Apogee: 1,000 km (600 mi). RT2 PL79-06 - . Nation: Russia. Agency: RVSN. Apogee: 1,000 km (600 mi). RT2 PL79-08 - . Nation: Russia. Agency: RVSN. Apogee: 1,000 km (600 mi). RT2 PL79-02 - . Nation: Russia. Agency: RVSN. Apogee: 1,000 km (600 mi). 1980 - . Launch Site: Plesetsk. LV Family: RT-2. Launch Vehicle: RT-2P. RT2 PL80-05 - . Nation: Russia. Agency: RVSN. Apogee: 1,000 km (600 mi). RT2 PL80-02 - . Nation: Russia. Agency: RVSN. Apogee: 1,000 km (600 mi). RT2 PL80-08 - . Nation: Russia. Agency: RVSN. Apogee: 1,000 km (600 mi). RT2 PL80-07 - . Nation: Russia. Agency: RVSN. Apogee: 1,000 km (600 mi). RT2 PL80-06 - . Nation: Russia. Agency: RVSN. Apogee: 1,000 km (600 mi). RT2 PL80-03 - . Nation: Russia. Agency: RVSN. Apogee: 1,000 km (600 mi). RT2 PL80-04 - . Nation: Russia. Agency: RVSN. Apogee: 1,000 km (600 mi). RT2 PL80-01 - . Nation: Russia. Agency: RVSN. Apogee: 1,000 km (600 mi). 1981 - . Launch Site: Plesetsk. LV Family: RT-2. Launch Vehicle: RT-2P. RT2 PL81-01 - . Nation: Russia. Agency: RVSN. Apogee: 1,000 km (600 mi). RT2 PL81-03 - . Nation: Russia. Agency: RVSN. Apogee: 1,000 km (600 mi). RT2 PL81-04 - . Nation: Russia. Agency: RVSN. Apogee: 1,000 km (600 mi). RT2 PL81-02 - . Nation: Russia. Agency: RVSN. Apogee: 1,000 km (600 mi). RT2 PL81-11 - . Nation: Russia. Agency: RVSN. Apogee: 1,000 km (600 mi). RT2 PL81-10 - . Nation: Russia. Agency: RVSN. Apogee: 1,000 km (600 mi). RT2 PL81-08 - . Nation: Russia. Agency: RVSN. Apogee: 1,000 km (600 mi). RT2 PL81-07 - . Nation: Russia. Agency: RVSN. Apogee: 1,000 km (600 mi). RT2 PL81-06 - . Nation: Russia. Agency: RVSN. Apogee: 1,000 km (600 mi). RT2 PL81-05 - . Nation: Russia. Agency: RVSN. Apogee: 1,000 km (600 mi). RT2 PL81-09 - . Nation: Russia. Agency: RVSN. Apogee: 1,000 km (600 mi). 1982 - . Launch Site: Plesetsk. LV Family: RT-2. Launch Vehicle: RT-2P. RT2 PL82-02 - . Nation: Russia. Agency: RVSN. Apogee: 1,000 km (600 mi). RT2 PL82-01 - . Nation: Russia. Agency: RVSN. Apogee: 1,000 km (600 mi). RT2 PL82-03 - . Nation: Russia. Agency: RVSN. Apogee: 1,000 km (600 mi). 1984 - . Launch Site: Plesetsk. LV Family: RT-2. Launch Vehicle: RT-2P. RT2 PL84-06 - . Nation: Russia. Agency: RVSN. Apogee: 1,000 km (600 mi). RT2 PL84-01 - . Nation: Russia. Agency: RVSN. Apogee: 1,000 km (600 mi). RT2 PL84-02 - . Nation: Russia. Agency: RVSN. Apogee: 1,000 km (600 mi). RT2 PL84-03 - . Nation: Russia. Agency: RVSN. Apogee: 1,000 km (600 mi). RT2 PL84-08 - . Nation: Russia. Agency: RVSN. Apogee: 1,000 km (600 mi). RT2 PL84-05 - . Nation: Russia. Agency: RVSN. Apogee: 1,000 km (600 mi). RT2 PL84-07 - . Nation: Russia. Agency: RVSN. Apogee: 1,000 km (600 mi). RT2 PL84-04 - . Nation: Russia. Agency: RVSN. Apogee: 1,000 km (600 mi). 1985 - . Launch Site: Plesetsk. LV Family: RT-2. Launch Vehicle: RT-2P. RT2 PL85-02 - . Nation: Russia. Agency: RVSN. Apogee: 1,000 km (600 mi). RT2 PL85-03 - . Nation: Russia. Agency: RVSN. Apogee: 1,000 km (600 mi). RT2 PL85-05 - . Nation: Russia. Agency: RVSN. Apogee: 1,000 km (600 mi). RT2 PL85-04 - . Nation: Russia. Agency: RVSN. Apogee: 1,000 km (600 mi). RT2 PL85-01 - . Nation: Russia. Agency: RVSN. Apogee: 1,000 km (600 mi). 1986 - . Launch Site: Plesetsk. LV Family: RT-2. Launch Vehicle: RT-2P. RT2 PL86-01 - . Nation: Russia. Agency: RVSN. Apogee: 1,000 km (600 mi). RT2 PL86-02 - . Nation: Russia. Agency: RVSN. Apogee: 1,000 km (600 mi). 1987 January 29 - . Launch Site: Plesetsk. LV Family: RT-2. Launch Vehicle: RT-2P. RT2 PL87-01 - . Nation: Russia. Agency: RVSN. Apogee: 1,000 km (600 mi).